The Fremonts gear up for new album and live cabaret! It has been a busy 8 months! We are incredibly proud to announce that our new album, The Failure Cabaret, is finished and will be released on Friday, April 26th. As if that wasn’t enough news, the release of the new album will be surrounded by three performances of our new stage show of the same name. We’ll be releasing more information about the where, the when and the why very soon. We had an incredible time playing with Foxfeather & Paul Kimbiris at eTown Music Hall back in May. The venue has a storied past and a sound that echos the historic voices that have show through it's halls. Throughout the next few months, we'll be posting some tunes from our live set here on thefremontsmusic.com. The first two available are a pair of new songs: Shadow Sees & The Kids Who Always Swim. 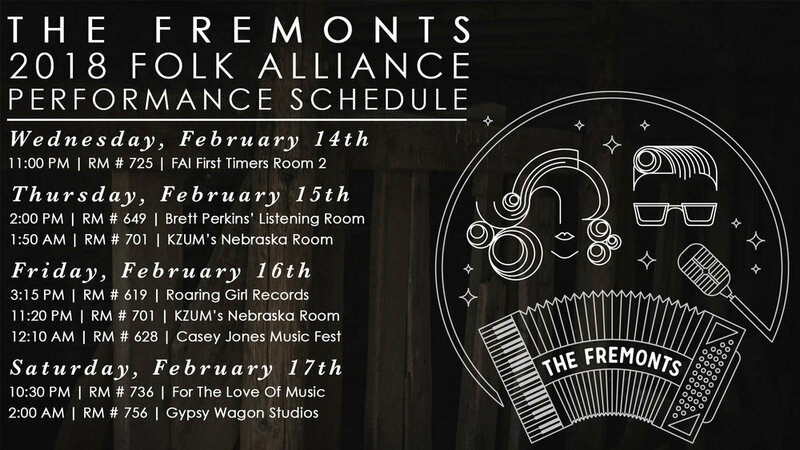 The Fremonts Head To Folk Alliance International! We Don't Live There, But They Do!! Before we get too far away from 2017, we want to share a little playlist of tunes from all the great artists we met and played with during our musical adventures in 2017. Give it a listen, there is a ton of really great independent music here. We would be lying if we said we didn’t leave a tear or two in Fremont, NE yesterday. With 36 shows and over 10,000 miles under our belts, we packed the car for the last time on this tour and pointed our wheels toward Boulder. It's been a whirlwind of a month out here on the road, so we thought we'd check in briefly to let you know that we're safe and having a killer time. We Don't Live There is Now Available! At long last, We Don't Live There is now officially released. We hope you enjoy listening to it as much as we enjoyed making it. We're proud to let the music do the talking for this one.